Ideal for kennel and grooming areas up to 2500 sq. ft. with 7 to 12 dogs or smaller areas with higher contamination. Can also be used for smaller kennel rooms with up to 10 cats or small dogs. The Air Oasis G3 3000 Xtreme UV Air Purifier is perfect for more contaminated areas with higher levels of known contaminants such as bacteria, viruses, molds, pet odors, mold, VOCs, chemical fumes and odors and more. The Air Oasis 3000 Xtreme is twice the strength of the Air Oasis G3 3000, enabling you to have a much higher level of effectiveness in areas of higher contamination. 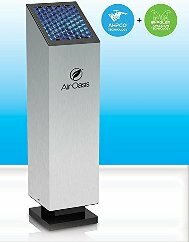 Air Oasis 3000 G3 Xtreme photocatalytic oxidation air purifier requires no annual maintenance (only replace the AHPCO Cell once every 2 to 3 years for $89).